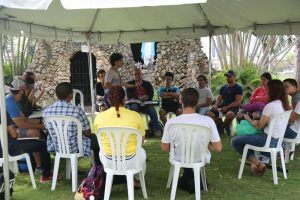 Class meets at Sagrado outdoors. The U.S. Department of Education has announced the 16 recipients of this year’s grants for education innovation and research. Recipients include organizations that are undertaking promising work in teacher professional development, reading and writing, school leadership and other practices. Often, we assume that increasing college graduate rates is worth the investment needed to spur that growth. The American Academy of Arts & Sciences decided to put an economist on the job of figuring out whether that’s true. In a report titled, “The Economic Impact of Increasing College Completion,” a team of analysts from Moody’s Analytics attempted to lay out the costs and benefits of a sustained investment program aimed at boosting program completion rates, especially for disadvantaged students. The bottom line: The investment would hurt in the beginning but pay off in big ways down the road.